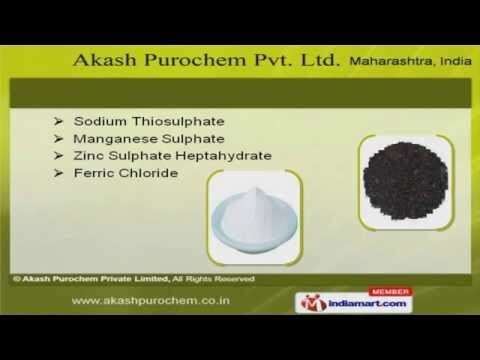 Welcome to Akash Purochem Private Limited. Manufacturer & Supplier of Industrial Chemicals. The company was incepted in 1986, at Mumbai. Our products are applicable in Chemical, Textile & Rubber Industries and we cater to Indian Subcontinent& Europe. Aarti Drugs Limited & Hetro Drugs are some of our esteemed clients and we are supported by accurate composition & Superior quality. We offer a wide assortment of Inorganic, Phosphate, Ammonium & Industries Chemicals. Inorganic Chemicals offered by us are well known for their properties. We offer Ferric Chloride, Manganese Sulphate & Sodium Thio sulphate that are extremely reliable. Our Phosphate Chemicals are a class apart. We also provide Ammonium Chemicals that are available at industry leading prices. Calcium Chloride, Magnesium Sulphate & Zinc Chloride Anhydrous are available under Industries Chemicals.